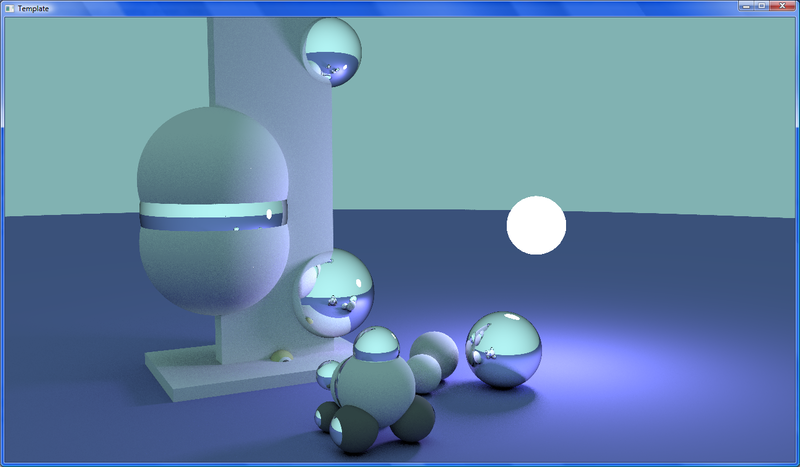 I'm really hooked on this path tracer, the photorealistic quality is so damn awesome. 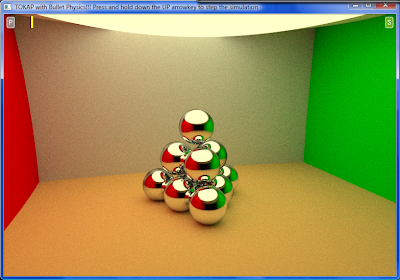 I've implemented the scene and physics in both the tokaspt and the Simplex Paternitas path tracers to see the difference in framerate and realism. "Activation context generation failed for "programme name". Dependent Assembly Microsoft.VC90.DebugCRT, processorArchitecture="x86", publicKeyToken = "1fc8b3b9a1e18e3b", type="win32", version="9.0.21022.8" could not be found. Please use sxstrace.exe for detailed diagnosis." This error is due to the fact that the demos were compiled with the Bullet library in debug mode and are dependent on the Visual C++ 2008 runtime library. Downloading the Microsoft Visual C++ 2008 Redistributable Package (x86) from http://www.microsoft.com/download/en/details.aspx?displaylang=en&id=29 should solve the issue. Damn this stuff is really addictive! 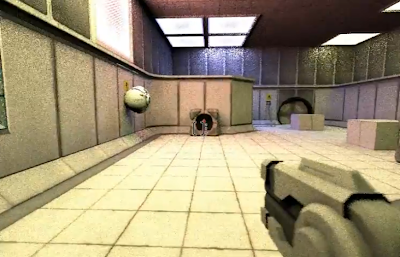 The above video was rendered on a ultra-low end GPU (8600M GT). 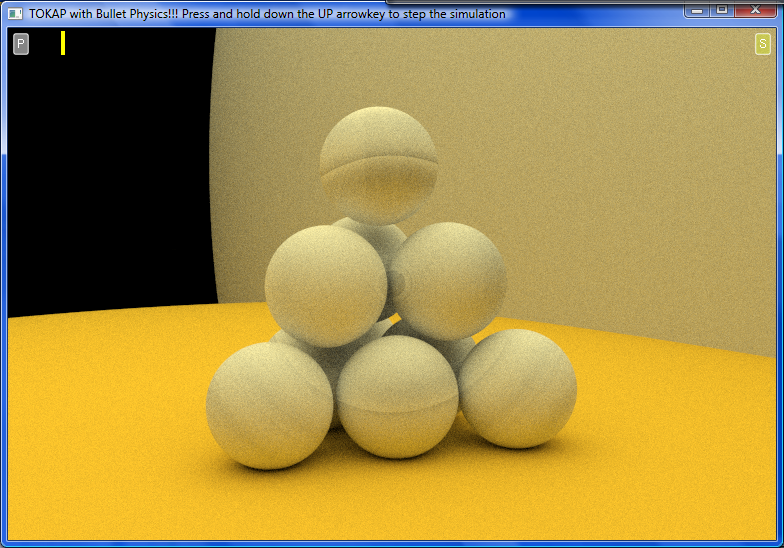 The animation should run at 60 fps on a GTX 580 at 8spp at default resolution. 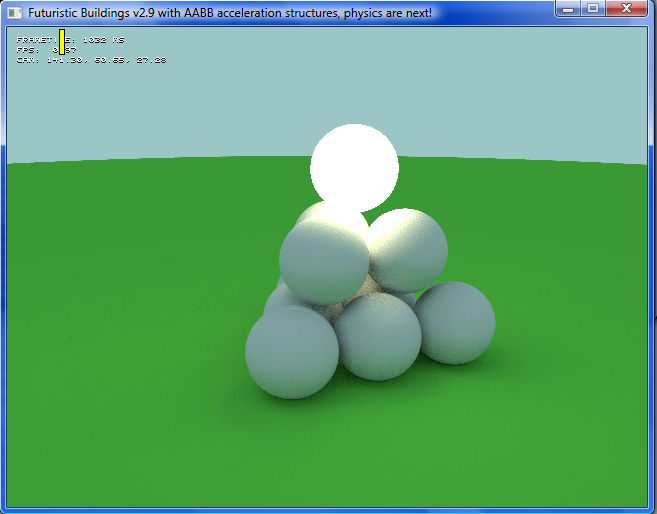 Physically accurate lighting + physics in real-time!!! I've implemented tight fitting AABB hitboxes around the car and the two buildings, which gives a nice performance boost of about 50-200%, depending on the viewpoint. Since the car can be moved (with the I, J, K, L keys), the AABB around the car is moving with it and its position is updated every frame. Real car physics are coming up next. 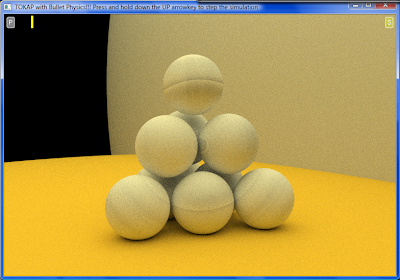 After those are in, OBBs (oriented bounding boxes) or oriented cylinders (depending on which one's cheaper to intersect) are on the todo list for some crazy real-time path traced physics simulations. "Finally, in Figure 5 we show a proof of concept of a real-time global illumination system that we plan to disclose in the near future. 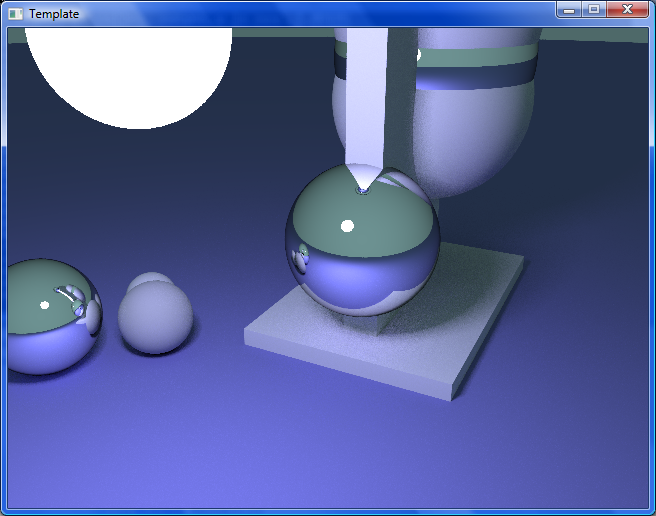 The system relies on our voxelization pipeline to create a proxy of the scene geometry that is used to trace incoherent rays. The proxy is rebuilt every frame, allowing support of fully dynamic geometry, materials and lighting." Combined with previous work from Pantaleoni on PantaRay (an out-of-core GPU ray tracing renderer for precomputing GI with LOD techniques, which was used in "Avatar") and on HLBVH and a yet to be released paper from Pantaleoni and Garanzha on "Simpler and Faster HLBVH with Work Queues" (which describes a system for real-time raytracing of dynamic scenes), this new voxelization technique could do wonders for real-time high quality global illumination and also for unbiased real-time GPU renderers. Several readers of this blog (woohoo I've got readers ;-) have asked me what skills you need to learn to make the demos that I've posted. To those, I want to give some C++ pointers (pun intended) in this post. Reading these books and doing the exercises with perseverance, I slowly got a hold on the C++ language. Frankly I'm amazed that the language becomes almost second nature so quickly. I'm still getting compiler errors that I don't understand, but luckily there is Google, which quickly solves the problem in most cases. 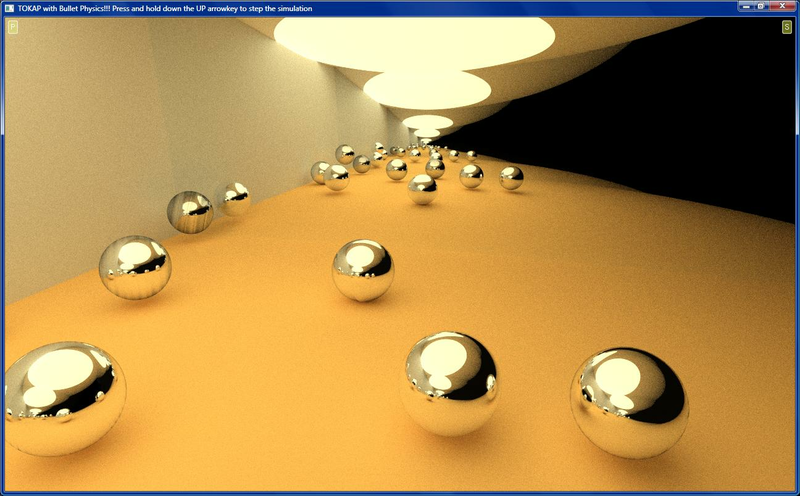 In order to write a real-time path tracing demo, learning C++ is not enough. Some basic knowledge about ray tracing and path tracing is necessary as well. 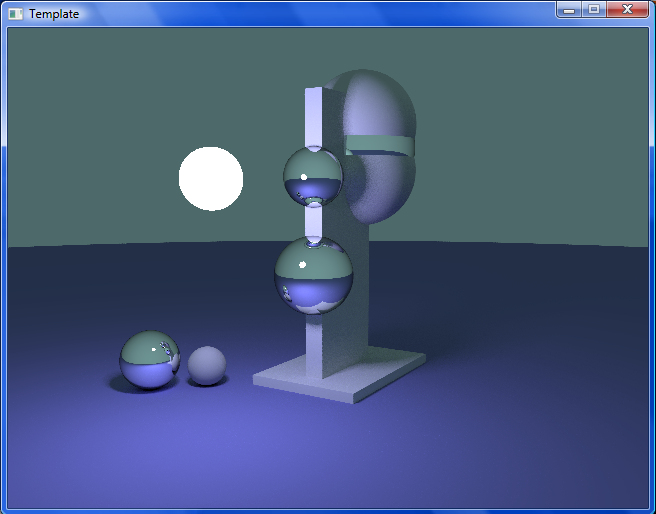 "Realistic Ray Tracing" by Shirley is an excellent resource for this. There are also lots of powerpoint presentations about ray tracing and Monte Carlo rendering on the net. 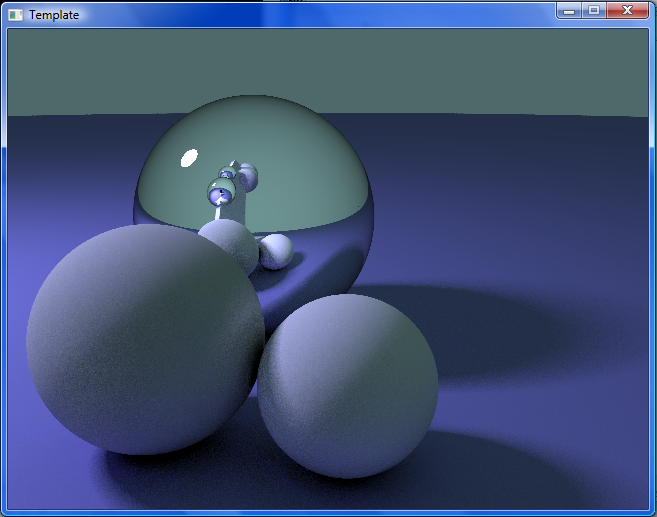 - Simplex Paternitas, another real-time CUDA path tracer by Jacco Bikker, this is an excellent starting point for learning to write new code and add new objects and animations (and see the results immediately). You don't have to touch the CUDA part of the code (although it's quite easy to understand once you're familiar with C++). 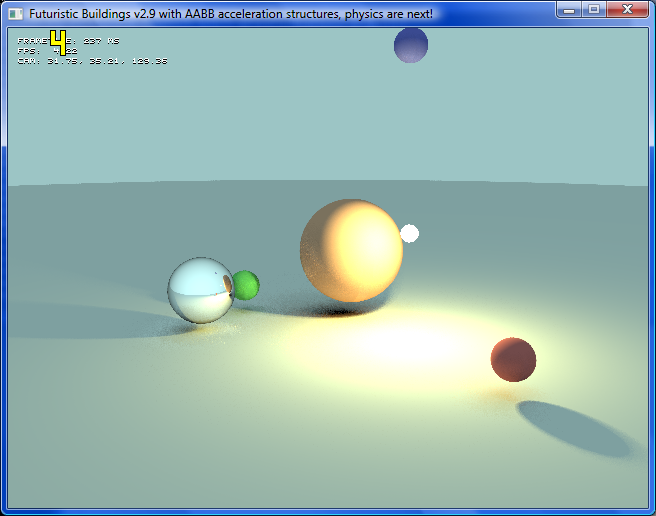 Every frame, all the framedata is passed from C++ to CUDA, so you only need to know C++ to write new animations and to add a physics library like Bullet Physics. Adding the Bullet Physics library to the code (as shown in my latest demo) and learning the Bullet API was actually not so difficult in retrospect (the Hello World example included in the Bullet SDK was very helpful in this respect). Right now, I'm incorporating the vehicle physics from the Bullet SDK into the Futuristic Buildings demo (which is based on the code framework of the Simplex Paternitas demo). It's kinda working right now, but I won't make a vid until I'm satisfied. The AABB hitboxes for the car and buildings are almost working as well (after identifying which variable triggered the ray shooting functions using the hitboxes). To summarize, learning the basics of C++ is a must. You have to invest some time in it (it took me about 3 months of learning in my spare time to get a good grasp on the basics and an additional month to read and understand someone else's code and adding own stuff). Understanding the structure of a program (which functions call other functions, which loop is the control flow entering, what stuff has to be initialized before rendering the first frame, how are variables efficiently shared between files, ...) is extremely important. From that point, you'll need creativity and perseverance to make an interesting demo and the possibilities will only be limited by imagination. A cool idea would be this one (this should be possible with fewer planks (20-30) in real-time once I've added support for oriented bounding boxes to represent the planks). 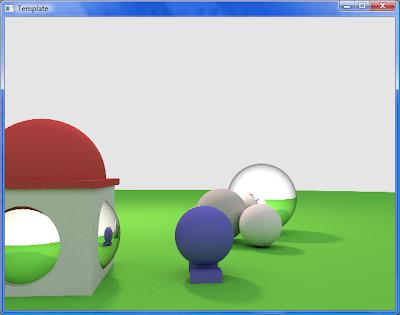 The paper "Accelerating path tracing by eye path reprojection" by Niklas Henrich et al., which I blogged about earlier is available from http://www.rendering.ovgu.de/publikationen.html. 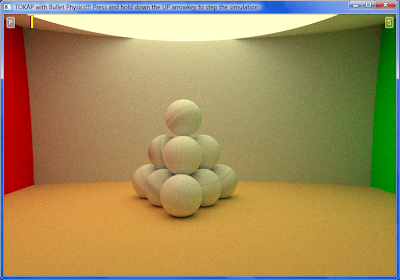 The algorithm achieves similar quality as regular path tracing in half the time and can easily be ported to the GPU. The authors also plan to incorporate their technique into a real-time raytracer. I've made two video's of somewhat better quality, resolution and framerate on the GTS 450, which is about 5x faster than a 8600M GT in Tokap (and about 8x faster in Futuristic Buildings). The animation is now being rendered at 60 fps, 8 spp per frame and 512x256 resolution. The physics simulation itself runs internally at 60 fps, so the physics are rendered in "true" real-time. 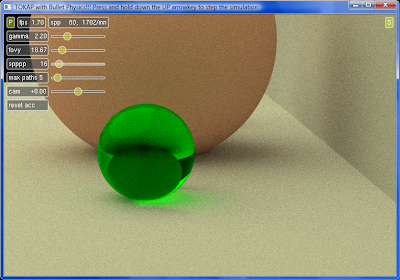 I've been wanting to integrate the Bullet Physics library in the real-time path tracing demo's like Tokap and Unbiased Truck Soccer for a while now (since February actually), but I lacked the programming knowledge and experience to make it work back then. 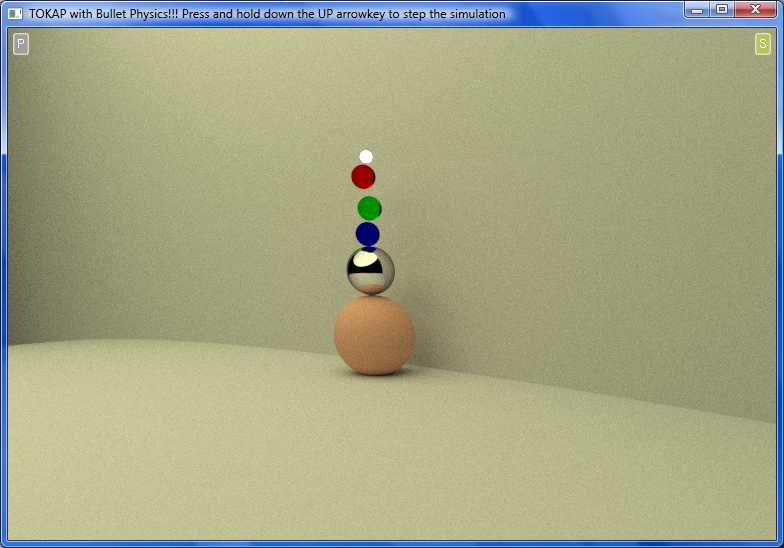 Today I've finally made it work, which will open up lots of new gameplay ideas for future demo's. 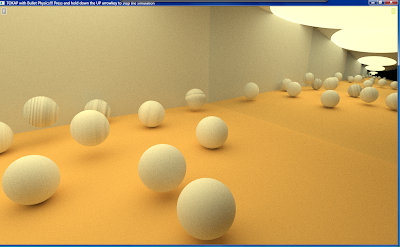 I retrofitted TOKAP (the real-time path traced 3D Pong) with the Bullet physics library and the results are awesome, even though I have only tested it on a very low-end 8600M GT. 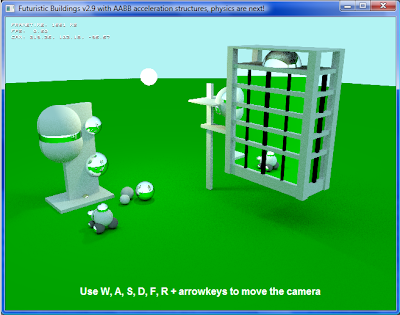 The physics simulation can be stepped and paused by holding down the UP key. 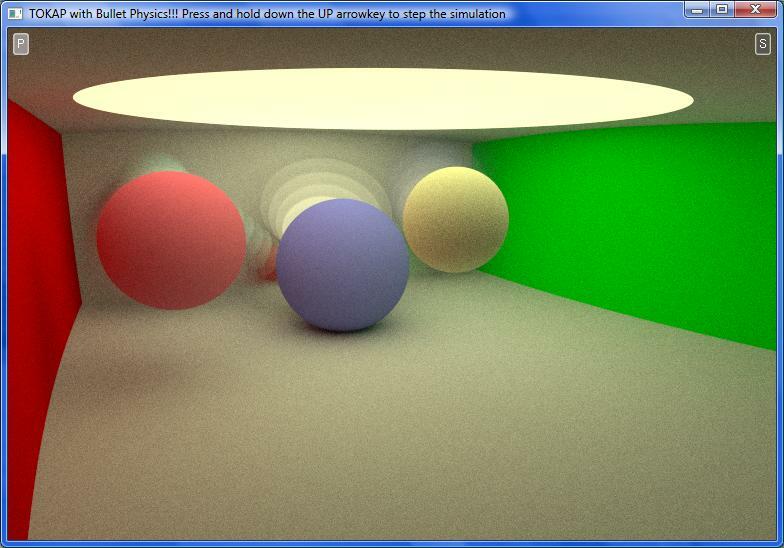 You can walk around the scene during simulation or when the simulation is paused as shown in the video. 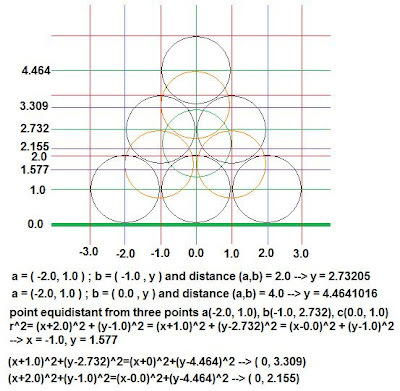 The simulation is deterministic, so it will produce the exact same result every time it runs. Now that I've passed this hurdle, the possibilities are endless and I will finally be able to implement proper car physics (see http://raytracey.blogspot.com/2011/03/unbiased-truck-soccer-first-physics.html). There are no 'hitboxes' (aabb acceleration structure) around the car and the buildings yet, which is responsible for the greatly reduced framerate. The path tracing performance should get a nice boost once they are implemented. 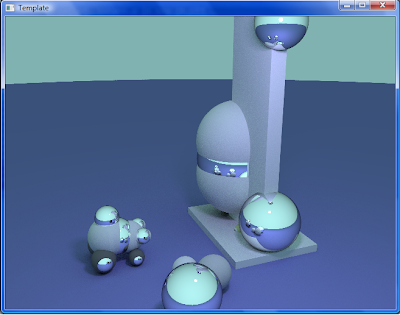 I still have to create a tight fitting bounding box around the car to increase the path tracing performance (although the performance is still quite good without it). 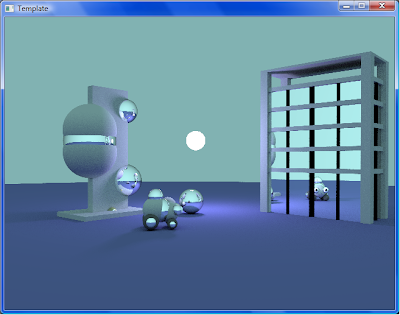 The source code of Simplex Paternitas also provides examples of rotation matrices and scripted camera animation sequences, so there are lots of cool things left to explore. The car will eventually be user controllable with a camera following the car and in contrast to my previous demos featuring the car (Unbiased Truck Soccer etc. ), it will also be able to rotate instead of just translate. UPDATE: The rotation of the car is now working. Below is a video that was rendered on my 8600M GT with only 4 samples per pixel per frame (framerate is about 5 fps at 640x480 resolution). I've decided to put my freshly learned C++ skills to the test, and what better way is there than modifying the source code of an already awesome program, in this case the recently released real-time path tracer "Simplex Paternitas" by Jacco Bikker. 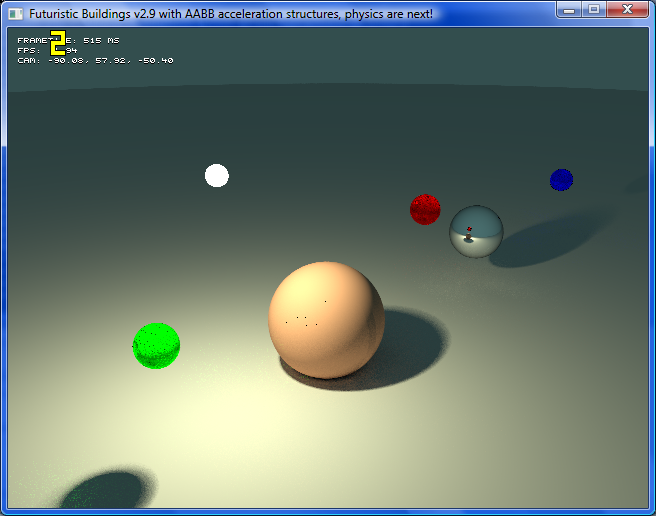 For "Futuristic Buildings" I modified some of the animation from Simplex Paternitas, added some new animations and also a new "skyscraper" building with moving spheres. 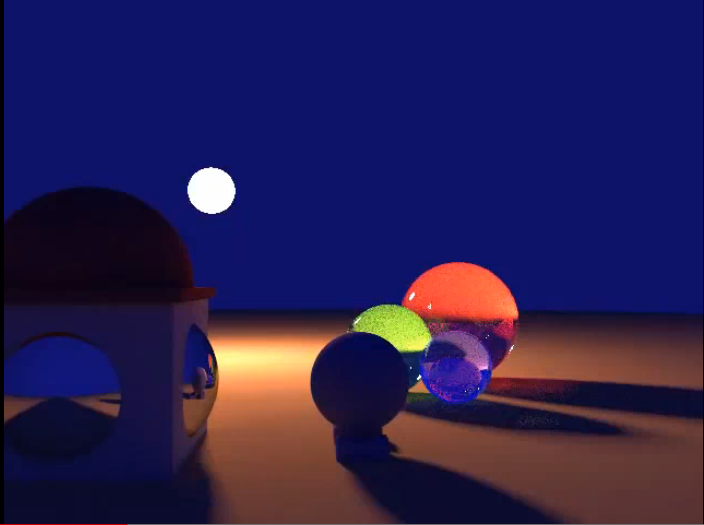 The purpose of this demo was to emphasize the extraordinary capabilities of this path tracer, in particular the ultra-high-quality global illumination with color bleeding and dynamic soft shadows at real-time framerates. The demo renders almost noise-free images at 16 samples per pixel and should render them very fast when you have a high end GPU (>30 fps I guess, I only tested it with a 8600 M GT). A CUDA enabled GPU is required as the path tracing happens entirely on the GPU. This is work in progress of course, I'm planning to add another building and a user-controllable character (the truck from Unbiased Truck Soccer :) . A video should follow soon. 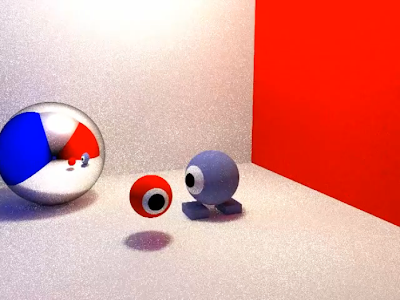 The animation reminds me of vintage CG from the eighties (like this one) which was rendered with either rasterization or Whitted-style ray tracing and needed several CPU hours per frame, while this is path traced in just a few milliseconds per frame. UPDATE: I tinkered a bit with the scene parameters (different colors and materials and brighter sky). 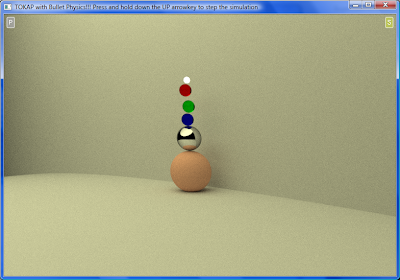 The image is taken at 28 samples per pixel. 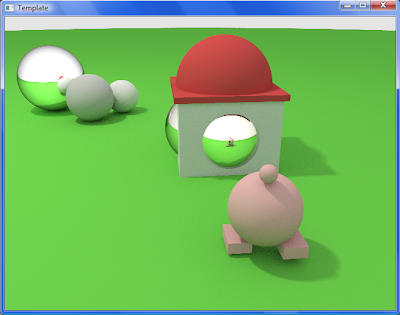 There is some slight greenish color bleeding from the ground onto the bottom half of the spheres and the character (not Kirby :) I will upload a video very soon. Even at 16 spp, there is almost no noise in the outdoor scene except for refractive spheres. 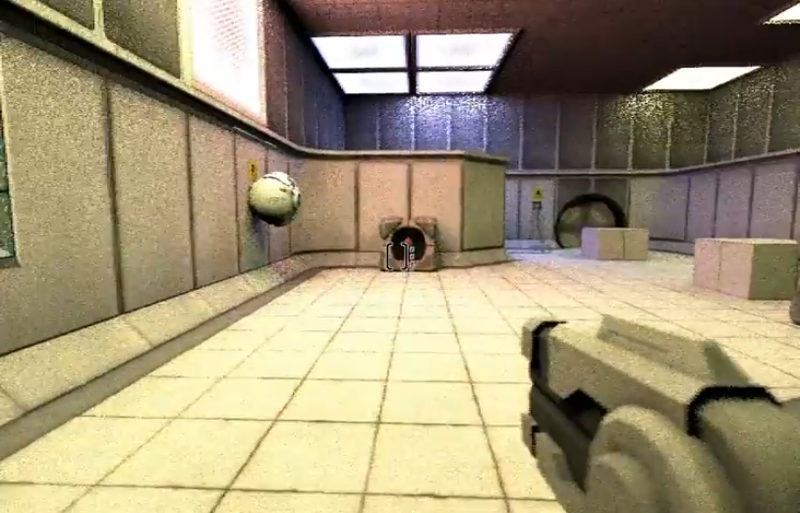 The game is running on 2 Xeon (quad core) CPUs and 2 GTX 460s in this video. The number of indirect light bounces seems rather low, but the mere fact that path tracing can be done at playable framerates and reasonable noise levels is quite a breakthrough. Real-time path tracing for games is finally becoming reality, and this is just the beginning. Congratz to the team behind Reflect! 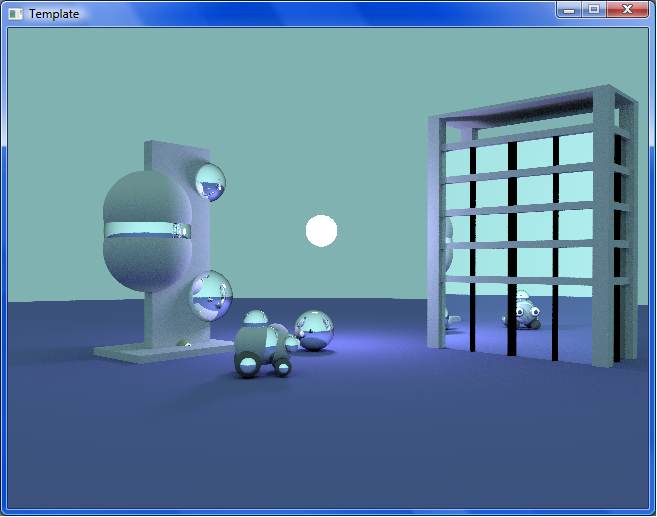 Just read an interesting paper called "Guided Image Filtering for Interactive High-quality Global Illumination" by Bauszat, Eisemann and Magnor, which was accepted at EGSR 2011. 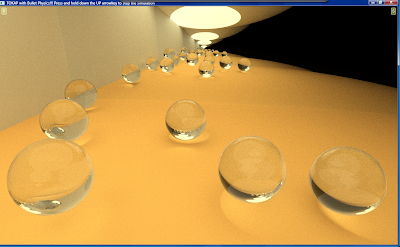 The paper describes a novel method for edge-aware filtering of noisy path traced images using the normal and depth buffers instead of the noise image itself. The indirect lighting is filtered separately from the direct lighting and the whole pipeline (path tracing + filtering) is implemented on the GPU using CUDA (the numbers in the paper are obtained with a GTX 285). The new method is compared to cross bilateral filtering and the edge-avoiding à-trous wavelet filter described in a HPG paper from last year and the results seem very promising. 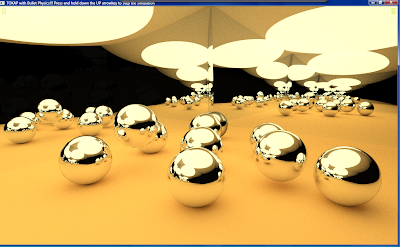 "...many approximations exist to reproduce certain effects of the real global illumination and try to incorporate it into a classic rasterizer. Unfortunately, in order to speed up the computation they are either aiming at simulating only a single effect, like soft shadows [ED08] or ambient occlusion [RGS09] or they are are limited to certain constraints, requiring low-frequency lighting environments [SKS02], static scenes [LSK07] or precise parameter adjustment for varying scenes [RGK08]. 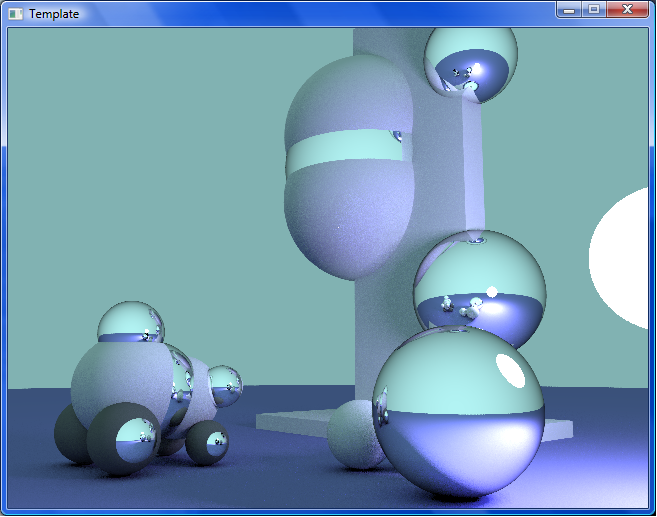 Code complexity increases tremendously for systems that simulate global illumination effects using rasterization because multiple approximations need to be combined to achieve a sufficient visual quality. 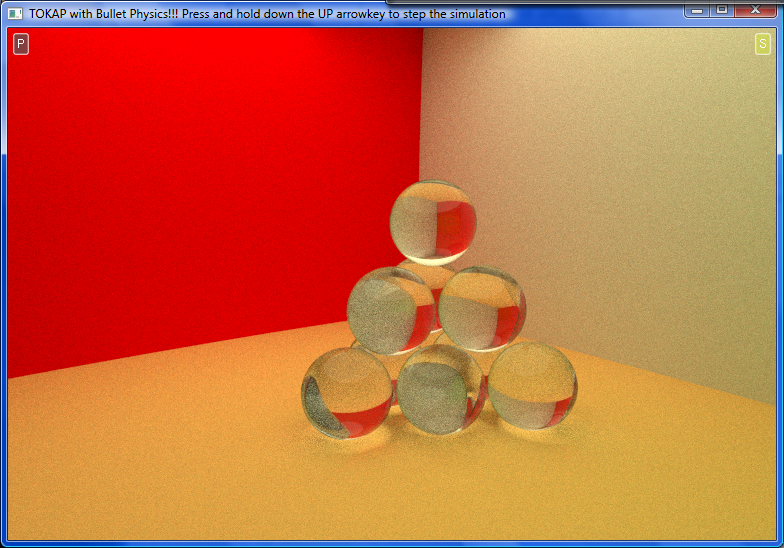 On the other hand path tracing naturally incorporates all these effects with a very simple rendering algorithm. 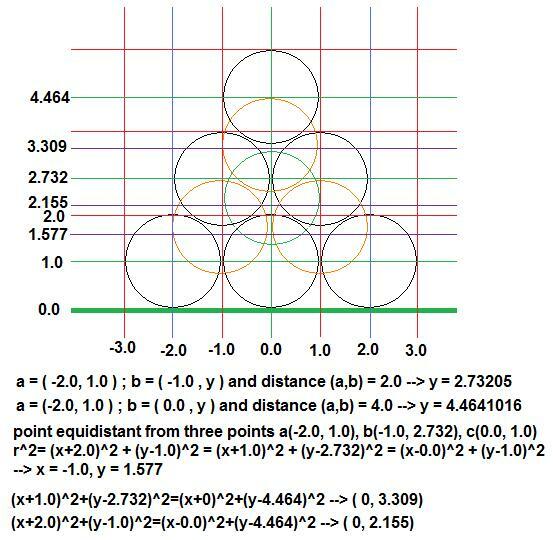 Another drawback of approximative algorithms is that they not necessarily converge to the correct result. Therefore, they will only become faster with better hardware but do not necessarily produce a higher quality result. Instead of trying to incorporate global illumination effects into a rendering pipeline which is not capable of physically correct rendering, it is a much more promising design to take a physically valid rendering approach and implement approximative algorithms on top to speed up the rendering. Designing them in an adjustable way results in a very future-oriented rendering paradigm." 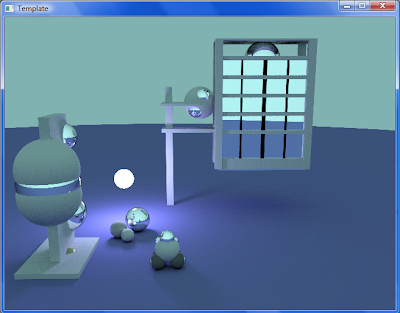 Research in fast interactive GPU path tracing with minimal noise has made enormous advancements over the past year and I'm confident that real-time high-quality path traced global illumination for games will be feasible soon.